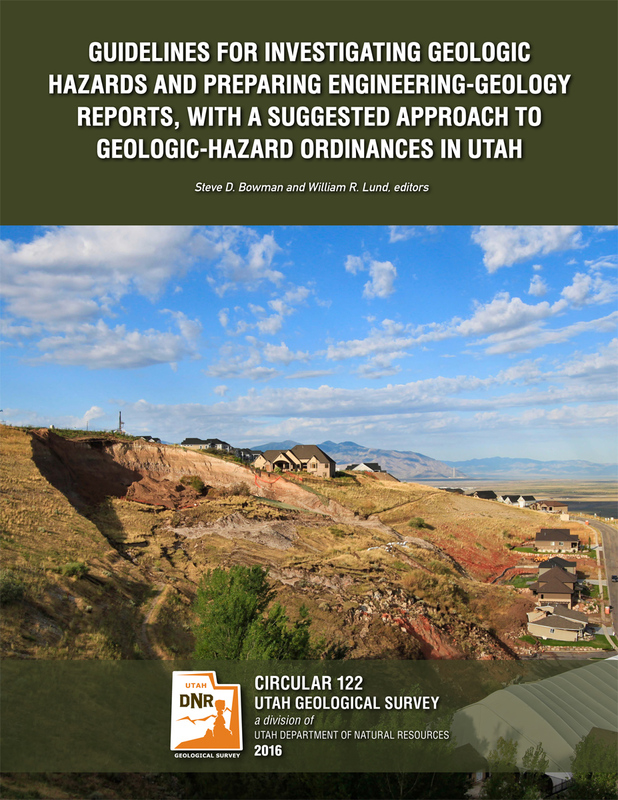 Guidelines published by the Utah Geological Survey to aid in geotechnical and/or geologic-hazards investigations and reports. Although these guidelines have been replaced with those in Circular 122 above, some ordinances still reflect these older guidelines. Association of Engineering Geologists (Utah Section), 1986, Guidelines for preparing engineering geologic reports in Utah: Utah Geological and Mineral Survey Miscellaneous Publication M, 2 p.
Christenson, G.E., 1987, Suggested approach to geologic hazards ordinances in Utah: Utah Geological and Mineral Survey Circular 79, 16 p.
Christenson, G.E., Batatian, L.D., and Nelson, C.V., 2003, Guidelines for evaluating surface-fault-rupture hazards in Utah: Utah Geological Survey Miscellaneous Publication 03-6, 14 p.
Hylland, M.D., 1996, Guidelines for evaluating landslide hazards in Utah: Utah Geological Survey Circular 92, 16 p.
Giraud, R.E., 2005, Guidelines for the geologic evaluation of debris-flow hazards on alluvial fans in Utah: Utah Geological Survey Miscellaneous Publication 05-6, 16 p.